We are a specialty finishes contractor founded 125 years ago. We serve the institutional, commercial, industrial, and residential construction markets in Western New York, northwest Pennsylvania and northeast Ohio. In Western New York, DeSpirt is the most experienced fabricator of dimensional stone applications such as granite countertops and vanities, marble fireplace surrounds, mantels and hearths, and related residential and commercial installations. 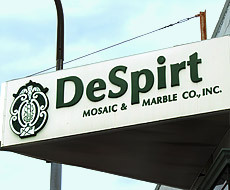 DeSpirt’s commercial installations include ceramic tile floors and walls, quarry tile, terrazzo floors, pre-cast terrazzo, marble and granite floors and walls (both interior and exterior), slate and limestone. DeSpirt also provides a full range of exterior architectural pavers and a complete line of high-performance seamless floor and wall systems for critical environments including epoxy, polyacrylate, neoprene latex and similar materials. Recent major projects in Western New York include school renovations for the City of Buffalo (9 schools in first phase), the Hauptman-Woodward Medical Research Institute, Inc., the Seneca Niagara Casino, and the Seneca Salamanca Casino. Current projects include the next phase of the City of Buffalo schools, the Buffalo Life Sciences Complex, Pittsford, NY school district, and the Seneca Niagara Hotel & Spa.